This is the final of three installments regarding my new 2012 Chevrolet Volt. If you would care to read the first post, it’s located here. I learned from my research about this automobile that what makes the Volt unique among hybrids is that it is a SERIAL hybrid. The Toyota Prius and the Nissan Leaf are parallel hybrids–the gasoline engine and the battery work simultaneously in conjunction. 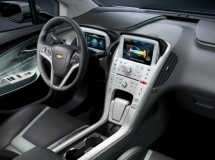 The Volt defaults first to the battery for propulsion and when the battery is depleted, the gasoline engine takes over. Actually, this happened during my test drive at the dealership. When we left the parking lot, I noticed that the battery level was down to a range of 6 miles. Shortly before we returned, the battery drained and the engine took over. I have to say that I would have NEVER even notice this if it weren’t the icons changing in the instrument panel. This transition in the means of propulsion is totally seamless. GM says that the Volt is designed to get about 37 miles per charge. The one I have, for some reason or another, charges to a full 41 miles. I actually get a little more than that–43 to 45 miles. I charge it about once a week, and a full charge takes approximately 9 hours. GM also says that the nine hour charging period costs about $1.50. In my part of the country, a full charge costs approximately $1.28. Do the math with me here–I do about 4 to 5 charges per month, which allows me to travel somewhere in the neighborhood of 215 to 225 miles. The cost to me to charge this vehicle is about $6.40. What car on the road these days can go 225 miles on six dollars worth of gas? The last time I bought gasoline was March 16 of this year. And, that gas went into the Cadillac that I traded in for the Volt. I’ll probably have to get the owner’s manual out to refresh my memory about where the button that unlocks the fuel door is located. Assuming I run out of gas, of course, and that doesn’t look to be any time within the foreseeable future. I understand, however, that GM has included in the technology of this car some sort of sensor on one of the chips that determines the age of the fuel in the tank. Once the fuel becomes 12 months old, this vehicle forces the gasoline engine to take over until the fuel is exhausted. I would assume that at some point it would allow the battery to take back over again, as I’m sure GM’s intention was not to strand motorists at the side of the road. The long and the short of the matter is that I will at LEAST have to fill the tank annually. The gas tank is small, however. Its capacity is a little under 10 gallons. It’s been a very long time since I’ve been able to fill a gasoline tank for less than $40. By the time it becomes necessary for me to fill the tank, perhaps it will be even less than $30. I think you can probably see why I took so much time in a full three posts to describe this experience. It’s been just simply amazing to me. Of all the cars I have either purchased or leased over the years, this one is by far my favorite. And, I’ve had 3 Cadillacs! Powerful, smooth, precise steering and handling, lots of toys, and a very comfortable and quiet ride. Couple all of that with the fuel economy, and what’s not to like? Well, for one, it is a little expensive. The one I have cost me about $37,000 because I got a few extras: navigation screen, rearview camera, and leather-trimmed interior. If you’ve got some money to burn and are in need of a new vehicle, I would highly recommend this car.